WILDERNESS WING SHOOTING and sport fishing with the experienced Wildman guides: two (2) days & nights at our NEW Ilnik River Cabin for Coho fishing or wing shooting, plus three (4) days guided local fishing or wingshooting via Jet Boat on our extensive local river system. Available Species: Silver Salmon, Rainbow Trout, Arctic Char and Dolly Varden, puddle ducks, sea ducks and willow ptarmigan. Fly Rod and Shotgun Rental and shot shells are available at the lodge. This trip has been featured on several outdoor television programs and in numerous magazine articles as one of Alaska’s top wing shooting and fishing destinations. Wing shooting anglers flock to Wildman Lake Lodge each fall to partake in the most unique Cast & Blast program available in the world today, and one that can only be found here on the remote Alaska Peninsula. Because the willow ptarmigan and waterfowl seasons coincide with some of the best stream fishing on the planet, we are able to combine both upland and waterfowl wing shooting outstanding angling for Silver Salmon, Arctic Char, Rainbow Trout and Steelhead in this remote part of Alaska. Add luxury accommodations, boats, planes, pointing dogs and a professional staff and you have the makings for an outdoor hunting and fishing vacation that is second to none. Beginning August 10th, willow ptarmigan can not only be found walking distance from the lodge but they are also accessible up or down river by boat or found at a number of nearby fly out locations. Each morning our head guide will recommend the best options for the day. Whether you choose a whole day of wing shooting, or just a half day, be assure there are plenty of salmon, trout and char to catch before dinner time. In Alaska, the ptarmigan limits are a generous 20 birds a day, with a maximum of 40 birds in possession. 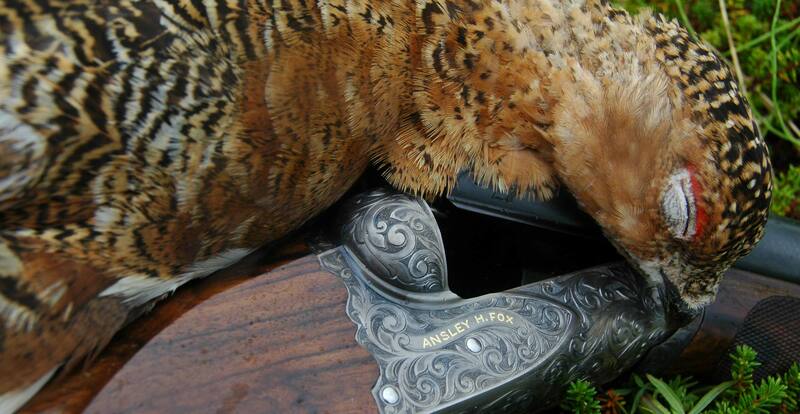 Our wing shooting guides will clean, package and freeze for transport. An Alaskan small game hunting license is all that is required and available at the lodge, as are shot shells and shot guns in both 20 and 12 gauge. 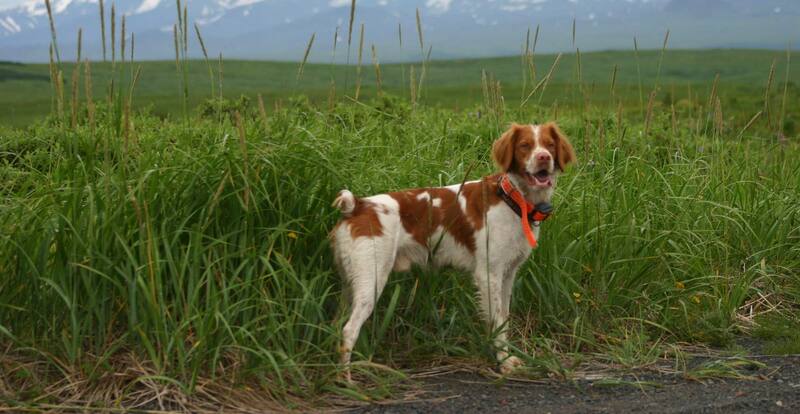 For the upland bird hunting enthusiast, hunting willow ptarmigan over our Brittany pointers is an adventure that needs to be on your “Bucket List”. 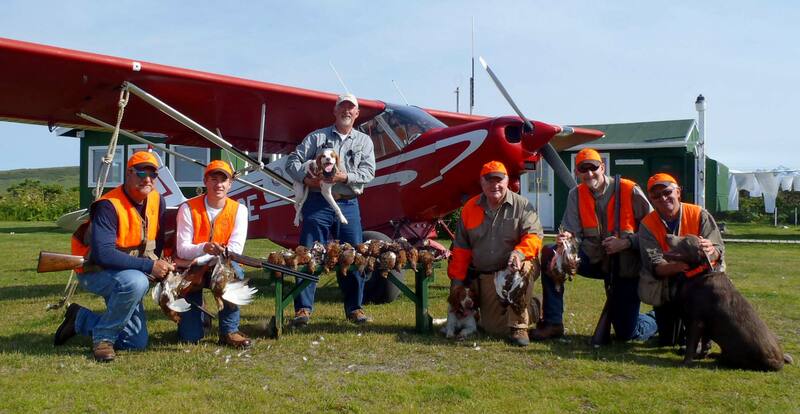 Our guides and dog handlers can take you on a morning hunt, afternoon hunt or an all day fly-out bird hunting excursion. You can combine upland bird hunting with any sport fishing package after August 10th, the perfect time to enjoy Alaska’s finest fishing for Arctic Char, Silver Salmon and Rainbow . Willow Ptarmigan exhibit a brown summer plumage with white wings. During the fall season they transition to a modeled red-brown and white, tending more toward while by late fall. Ptarmigan eventually turn completely white by early winter with a black tail and beak. Waterfowl season opens on September 1st in Alaska, but most hard-core waterfowl hunters prefer to come a bit later in September, when big numbers of northern birds join our local ducks before the mid October push south, like these Pintail above. Waterfowl is abundant this time of year at Wildman Lake Lodge. Each summer vast numbers of ducks, geese, swans and crane nest on the remote Alaska Peninsula. Even more birds gather here in the fall as the ample seeds and berries ripen in our area. By mid-September, we see thousands of ducks gathering along the rivers, streams, on small lakes and the all around the brackish lagoon on our lower river. It is a waterfowl hunter’s paradise! Part of your trip will include a fly out to a remote Bering Sea coastal bear, with just you, your overnight gear, shotgun and guide… oh, and plenty of shot gun shells! This is where we have a very comfortable overnight cabin, plus boats, blinds and decoys for wing shooting guests. As with most duck hunting, early morning and evening shooting is generally best, so having the cabin right here is a perfect waterfowl retreat. But that’s not all! This river-side cabin on the Bering Sea coast also doubles as one of our best salmon fishing camp. When you aren’t in a duck blind, you can enjoy great silver salmon fishing or you may choose to venture up river to ptarmigan ridge for more wing shooting. But, you had better take a trout rod because just a little further up this winding river is one of our best, but rarely fished, Arctic Char and trout fishing holes, generally an every cast program! Wildman’s Cast & Blast Camp virtually sits on an aerial highway where hunters see many species such as Mallard, Green Wing Teal, Gadwall, Northern Pintail, American Shovelers, American Widgeons, both Common and Barrows Golden Eye, Scaup (Blue Bill), the beautiful long tail Harlequin as well as Surf Scoters and the prize King Eider. Plus we have Sandhill Crane and Pacific Black Brant as well as Canadian, Speckle Belly and Snow Geese. Closed to harvest, yet in abundant numbers are the protected Aleutian Emperor Goose and Tundra Swans. Epic Silver Salmon fishing is right in front of the cabin and ptarmigan hunting and world-class Arctic Char fishing is just scenic jet boat ride up Volcano Creek from the cabin. Whether you choose to come for Ptarmigan & Fishing in August, or come for the full bag: Ptarmigan, Waterfowl, Salmon & Char in September, Wildman Cast & Blast will INCLUDE: 6 days and 6 nights of wilderness hunting and fishing, all meals, guides and accommodations, as well as the scenic ROUND TRIP flight from Anchorage aboard fast and comfortable twin engine aircraft, a $1,500 per person value. August or September is a perfect time of the season to catch a variety of different salmon species as well as native rainbow, Dolly Varden and Arctic Char. 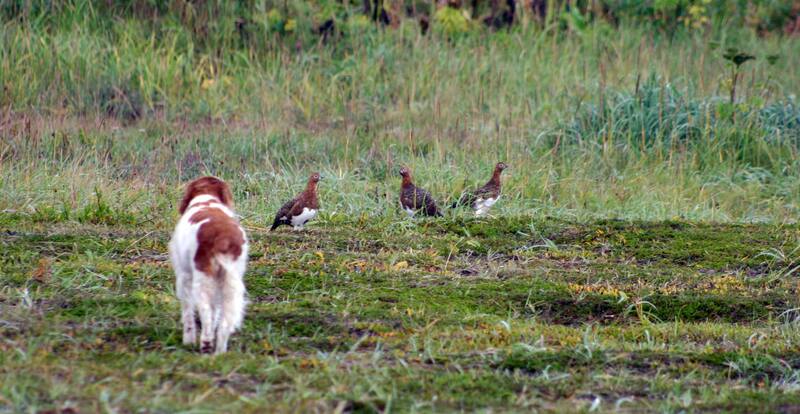 Wing shooting wild upland birds over our American Brittanys and September hunts include overnight waterfowl hunting at our comfortable “Wildman Cast & Blast Cabin.” This is the ULTIMATE Alaska wing shooting and sport fishing package. We will have pointer/retriever Brittanys with handlers available during this period as well as our full staff of professional guides. Package Includes: Scenic round trip flight from Anchorage to Wildman Lake Lodge and return, gourmet meals, deluxe lodging, three days of fishing salmon, trout and char fishing and bird hunting via jet boat. Plus a fly out for two days and one night at the NEW “Wildman Cast & Blast Cabin” where you will enjoy unlimited hours of salmon fishing, and experience some of Alaska’s most remote fishing and wingshooting locations, only accessible by bush plane and jetboat. You will also enjoy half day of guided fishing, after lunch on your arrival day at Wildman Lake Lodge. Only $7,950.00 per person. This package includes: The scenic, direct flight from Anchorage to Wildman Lake Lodge, and return, all meals & lodging, T lodge spin fishing gear, fish cleaning, vacuum packing, freezing and travel box, three (3) days guided fly out days and four (4) days guided fishing via Jet Boat on the incredible Wildman artesian river system.